Systemic racism is the main reason why we tolerate statistics regarding our criminal justice system. This was my explanation and the response @MattL3m0n offered. However, I felt like this deserved more than a cursory discussion on Twitter and my normal 140 character-limit-induced wisecracks. The punitive model for our “justice” system in Canada and the U.S. is deeply flawed. 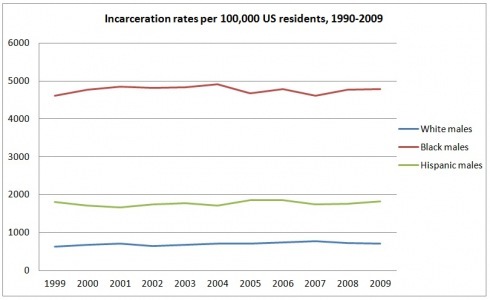 We incarcerate people at higher rates than any other developed nation. 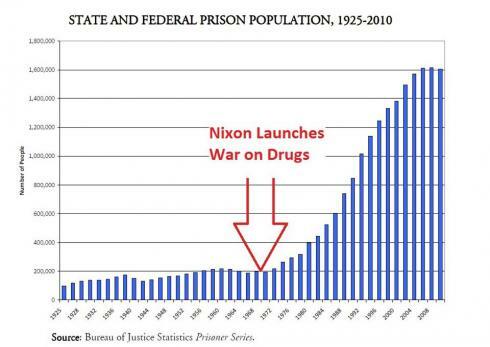 However, even with tougher sentences, increased police power, and tougher laws that have led to 1:100 U.S. citizens being incarcerated and 1:31 being on parole, this punitive model for justice does not effectively reduce crime. This justice system is also incredibly racist. In the U.S.A our jails are disproporitionately made up of Black and Hispanic people. In Canada, the jails are dispraportioantely made up of First Nations/Native American people. In the U.S.A Native Americans are often represented three to seven times as much in the inmate population than the general population. Black men are five times more likely and Hispanic men are three times more likely to go to jail than white men. In NYC white suspects are frisked 8% of the time when approached by the police, but Black and Hispanic men are frisked 85% of the time. The American Bar Association has directly stated that many people admit to crimes that they did not commit in plea bargains in order to avoid the risk of losing at trial and serving a much longer sentence. Often armed with only a public defender, and faced with a jury of peers that look nothing like them, this is the only sensible option. Once you are in the prison system this sets you back in a number of ways. It limits your opportunities for employment, and even then race is a factor. Whites with a criminal record get a call back from employers 17% of the time, while black with a criminal record only get a call back 5% of the time. It disenfranchises you as a felony eliminates your right to vote. This means that you cannot participate in a fundamental way to the democratic process to impact change in the U.S. justice and legal system. This again disproportionately impacts ethnic minorities so it disenfranchises them the most. It takes you out of your community, your family and disables you from providing for any family or dependents you have. This leads to a break down of the family and often and increased reliance on social welfare or other desperate measures that are problematic most commonly some form of participation in the illicit economy (prostitution, loan-sharks, drug-dealing, etc.). The sum result of all of this is that we have effectively re-created a caste system in the U.S.A.. You can read more about this in the book, “The New Jim Crow” but this quotation sums it up well. We have also legally sanctioned slavery and lynching. Now this is a provocative statement but it is true. In jail you can be used for unpaid labor. This is the very definition of slavery. The application of the death penalty and the prosecution of these cases is also incredibly racially unjust and slanted against ethnic minorities. How do we explain these realities and statistics? These statistics are not new. Anyone who has been around for a while has most likely heard them used in an argument or referenced at least indirectly? When confronted with these statistics, we have to explain and interpret them and how we do determines what actions we think need to be taken and if there is any moral imperative that propels those actions. For me, these numbers point overwhelming point to institutionalized racism. If we accept these numbers and do nothing to remedy the situation we accept the racist conditioning of Western society and align ourselves with this racist narrative as we must take one of two basic options. First, we might simply accept or ignore these numbers and move on with our daily lives. This is burying our head in the sand and ignoring racial injustice which makes us complicit in these injustices. By our inaction, we prove that we do not care about injustices suffered by ethnic minorities because we do not believe they deserve basic human rights or justice because they are not white. Second, one might suggest that these statistics are justified because ethnic minorities are committing more crimes that whites. 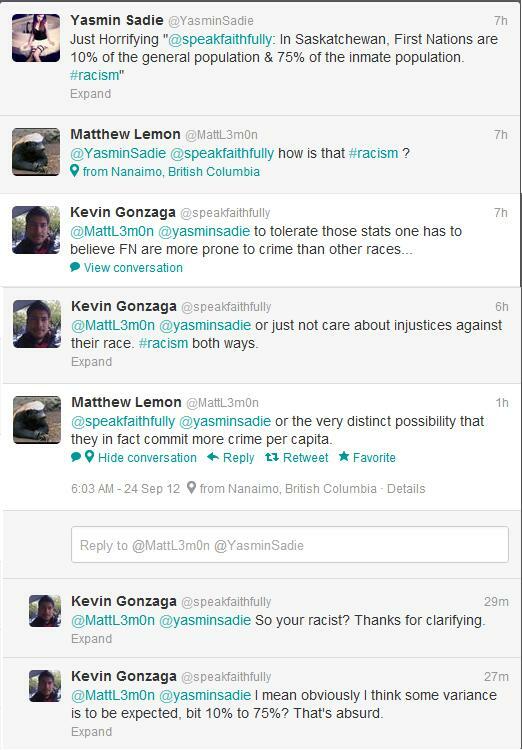 This is a tactic often employed by white people, of which Matthew Lemon is by no means the first. The implicit assumption is that ethnic minorities are more savage, lawless, and barbaric in nature and are more prone to crimes. If this tactic is employed the justice system is not broken or racist, it is doing its job by incarcerating people who are breaking the laws. There is no need for change and there is nothing for white people to do but shake one’s head at the lawlessness of minorities. This second option is a gigantic racist cop-out. It relies upon an entire culture that fears and vilifies ethnic minorities, especially male ethnic minorities. It dehumanize them, and relies upon stereotypes and misinformation. Instead of rightly seeing the injustice in the system, they use the results of the unjust system to support their theory. The “logic” is that minorities are in jail because minorities commit more crimes. Minorities commit more crimes because they are fundamentally/racially inferior as evidenced by their higher incarceration rates compared to whites. This is circular racist logic. This second option is also a time-honored way for white people (and those that align themselves with them) to dodge introspection and the need to subsequently wrestle with things like white privilege, systemic racism and other aspects of Western society that are aimed at maintaining white people and white culture as the dominant culture in our “pluralistic” society. I will never forget the first time I saw it directly employed in real life. I was in my hometown relating my horror after visiting a local juvenile hall. There were three hundred youth in the auditorium at this hall and all but five were black. I was telling this story to a middle-class white female colleague of mine and I as I suggested this was a sign of racial injustice in the criminal system she retorted that, “That’s who lives in the area and that’s who is committing the crimes.” She completely dismissed the concept of racially based injustice out of hand. The mind-boggling fact was that black people are only 2% of my hometown. To this privileged white woman, it made more sense that two percent of our juvenile population were committing 98.3% of the juvenile crime and the entire justice system was color blind and fair than it did that any other factor related to race might play a role in justice in the U.S.A. However, considering all the statistics out there and the complicated issues regarding race, colonialism, tribal sovereignty, poverty, civil rights, etc. it appears to me that the reason First Nations in Saskatchewan represent 75% of the inmate population and only 10% of the general population cannot simplistically be explained by suggesting First Nations commit more crimes per capita than white people. This train of thought is statistically and rationally unfounded and is inherently racist. P.S. My original quotation was cut off. I did not just hashtag this stat as #racism, I hashtagged it as #cdnpoli as well to indicate that this statistic is a systemic, socially approved form of racism in Canada. This is a notion which your words and attitudes support. This entry was posted in Personal Commentary and tagged Canadian racism, injustice, justice, penal justice, race based injustice, racism in the USA, systematic racism. Bookmark the permalink.